India tends to flaunt her rich history especially her traditional jewelry. Initially jewelry was used solely for the purposes of ornamentation but over time it has acquired more social and spiritual significance. Precious stones for example are believed to be lucky as they bring health and wealth to the wearer. 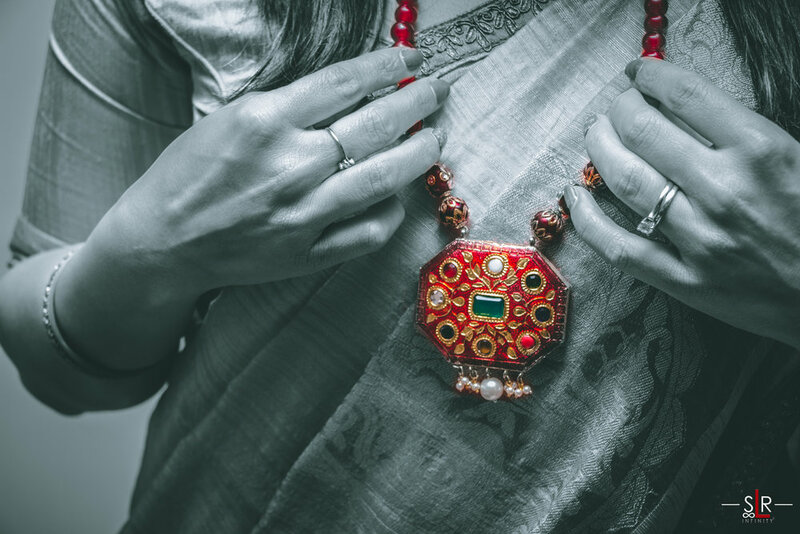 Navaratna: meaning nine gems is one significant piece of art that is popular in the Indian culture as it signifies power and luck. A navaratna is crafted with nine gems namely diamond, ruby, emerald, coral, pearl, yellow sapphire, blue sapphire, hessonite and cat's eye. Each gem has a Vedic astrological meaning attached to it. Read more about the astrological meaning. Do you recall Akbar’s nine courtiers-his navaratnas? I suppose the number 9 has some kind of significance in the Indian culture? Fun fact about Akbar (for which he deserves huge respect): during an era where education for women was an alien concept, Akbar built a library exclusively for women and instituted schools throughout the Mughal Empire! *Disclaimer- I bought my navaratna ornament from an exhibition in Gujarat- yes my gems aren’t real. Smile, spread smiles and you will naturally attract good health and power. I am sure gemstones have some sort of power but- the greater power dwells inside you!